Shall we take the ferry to Nantucket to visit the Folger Shakespeare Library? North and west facades of the Folger Shakespeare Library the year before it opened (Folger Shakespeare Library). Diagram in Henry Folger’s hand of four possible library sites on Capitol Hill (Folger Shakespeare Library). “I finally concluded I would give it to Washington; for I am a patriot,” Folger affirmed. Before WWI, Washington was a sleepy southern town. Contributing to the literary and cultural enhancement of the political capital appealed to the Folgers. Perhaps without fully realizing the extent of their gift, the Folgers, in their quiet way, were responsible for an uptick in America’s reputation and prestige: the moment of arrival for the young country on the world scene as Europe’s equal, and, in some respects, superior. Secrecy was a practice Folger applied to his real estate acquisitions as well as to his book buying. In 1918 he wrote to a land speculator known for his clandestine purchases asking him to “inquire very cautiously” about four locations on Capitol Hill. One, noted on city maps as “future gov’t building,” would become twenty years later the Supreme Court; that was a non-starter. A second became the Lutheran Church of the Reformation across 2nd Street NE from the Court on East Capitol Street. A third eventually became the Madison building of the Library of Congress. The Folgers decided on one of the most opulent blocks on the Hill: an assemblage of fourteen redbrick Italianate rowhouses known as Grant’s Row (no relation to the author). It cost Folger $317,000 and took him more than eight years to buy the properties on the 200 block of East Capitol Street SE. Henry Folger’s name appeared on no document related to the transaction: as a result, virtually no one knew he had become the owner. 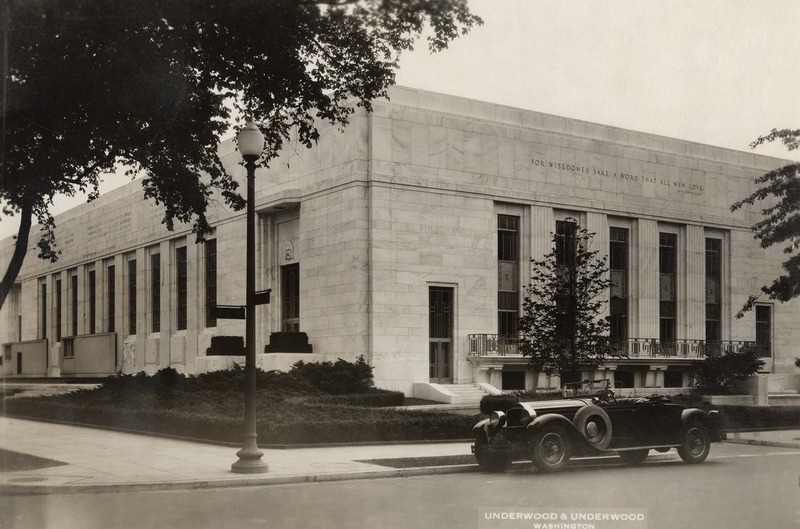 In mid-January 1928, the Folgers read with horror a Washington Post article that a bill pending in Congress had identified Grant’s Row and the lot to the south for a Library of Congress annex. With trepidation, Henry wrote Herbert Putnam, the Librarian of Congress, “Should I give up the thought of making Washington the choice for a location [of my Shakespeare library]?” Without hesitation, an elated Dr. Putnam agreed to have the bill modified so that the annex would spare the Folgers’ property but occupy the remaining portion of the two lots. A wise Congress recognized the numerous benefits of having a private specialized library across the street from a public general library. 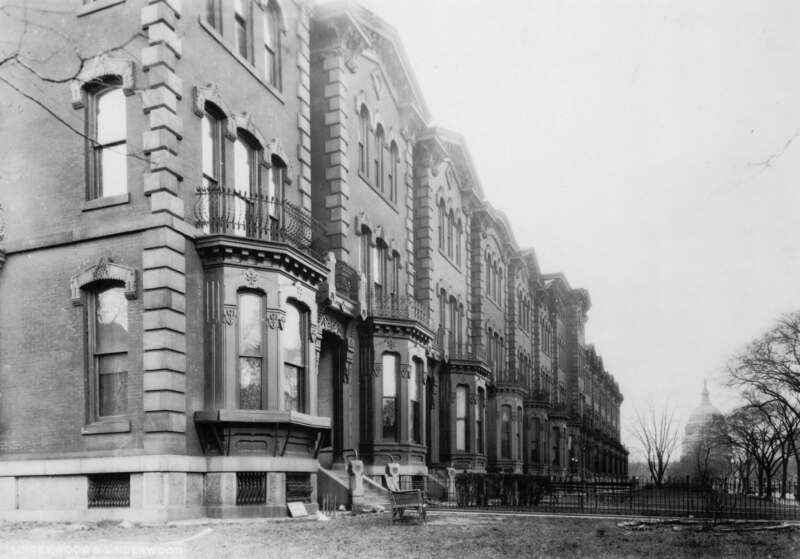 Grant’s Row, the fourteen redbrick rowhouses built by Albert Grant and which were demolished (Library of Congress). The Folgers would endow the library, build a decorative façade on its north side, and “dedicate this remarkable collection to the culture of the American public.” Both House and Senate passed the modified legislation unanimously. President Coolidge signed the bill (Public Law 70-453) into law on May 21, 1928. It is especially appropriate in 2014—the 450th anniversary of Shakespeare’s birthday—to celebrate the world-class Folger Shakespeare Library and its founders, who eighty-two years ago defined the purpose of the research library: to “give generations to come a better working knowledge and understanding of the literary works of the seventeenth century.” Stephen H. Grant is the author of Collecting Shakespeare: The Story of Henry and Emily Folger, published by Johns Hopkins. He is a senior fellow at the Association for Diplomatic Studies and Training and the author of Peter Strickland: New London Shipmaster, Boston Merchant, First Consul to Senegal. Meet Steve at Washington's Politics and Prose Bookstore during his book talk and signing on July 26 at 6:00 p.m. Happy Birthday, Henry Clay Folger!